Explore the rich, sweet world of one of history's most popular foods in "Chocolate: The Exhibition"
The history of chocolate can be traced back nearly 4,000 years to the ancient Mesoamericans of Mexico and Central America, where it was generally served as a drink and remained virtually unknown to the rest of the world until the 16th century. As we all know, chocolate has since been processed into a vast variety of forms and flavors that have transformed the once-humble seeds of the cacao tree into one of the world’s most craved indulgences and successful enterprises. On Saturday, October 20, faculty and staff from Miami's College of Arts and Science (CAS) will host "Miami University Gallery Talks" at Cincinnati Museum Center (CMC) from 12 noon to 2 pm. They will give informal presentations, tours, and Q&A sessions to explore the chemistry of chocolate, how chocolate farming has changed ecosystems, the impact of chocolate on international politics over the centuries, and more. 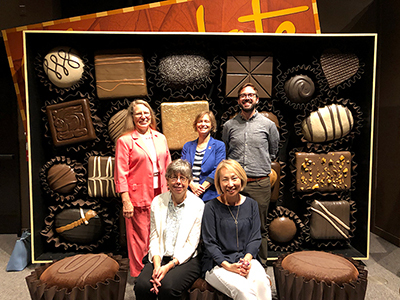 Miami faculty speakers (L to R: Susan Marine, Ann Hagerman, Renee Baernstein, Heeyoung Tai, Will Brown) pose in front of 'Chocolate: The Exhibition' museum display. "Miami University Gallery Talks" is the latest collaboration between CAS and CMC, as part of CMC's current "Chocolate: The Exhibition" at Union Terminal in downtown Cincinnati until January 6. Previously, CAS and CMC collaborated on "Vikings: Beyond the Legend" and "Da Vinci: The Genius." "A chocolate bar will never taste the same again, once you've seen this show," said Renée Baernstein, professor of history and CAS senior associate dean. "Behind everyone's favorite sweet lies a dark history of war and conquest, and a complex chemistry of taste." The consumption of cocoa-based products fuels the industrial transformation of landscapes and ecologies worldwide, with ramifications as near as your own backyard. Come learn about how cocoa connects you to a wide range of cool plant and animal species, and how you can positively influence the world through your purchasing decisions. Grinding roasted cacao nibs is essential to making a smooth chocolate. How much grinding is enough? What happens to the crystal structure when the chocolate is ground or heated? How did Europeans develop a taste for cacao? How did Mesoamerican cacahuatl become European chocolate? Come see (and smell!) how the pressures of trade, technology, and taste transformed cacao as it travelled from the New World to the Old. How are cacao beans collected and processed to make delicious chocolate? Come learn about a small-scale operation and see a large, industrial scale. Then play a game based on what you learned. Could eating chocolate be good for you? Chocolate is loaded with antioxidants, shown in laboratory tests to potentially prevent cardiovascular disease, hypertension, cancer, and Alzheimer's disease. Come learn about the missing links in the chocolate-health story. Have you ever wondered what makes chocolate "melt in your mouth, but not in your hand"? The secret is the cocoa butter, the most expensive fat in the world. It has unique melting characteristics that make your chocolate melt at a perfect temperature. Come and learn about the fats (and oils) that can make your food divine. The Miami University Gallery Talks event is free with admission to "Chocolate: The Exhibition" and is organized by Baernstein as well as Cincinnati Museum Center's Maggie Kelly and Brandy Glaza. "The exhibition brings to life the science, culture, marketing, and ecology of chocolate," said Baernstein. "Miami faculty are excited to be providing some hands-on demonstrations and interactive talks to this exciting show. Plus it's kid-friendly, so bring the family." Gallery Talks will take place at the same time as CMC's "Choctober" celebration in the Duke Energy Children's Museum. Families can take advantage of the whole day by exploring Chocolate: The Exhibition with Miami, then participating in a cacao bean dissection or hot chocolate painting session in the Children's Museum. To purchase exhibition tickets and learn more, visit Chocolate: The Exhibition. There is a $3 discount off of Chocolate: The Exhibition for Miami faculty, staff, and students by showing their Miami ID at the box office or with the online code SUPERMIAMI.